If you’re anything like us, you probably celebrated the 4th of July with a delicious meal. 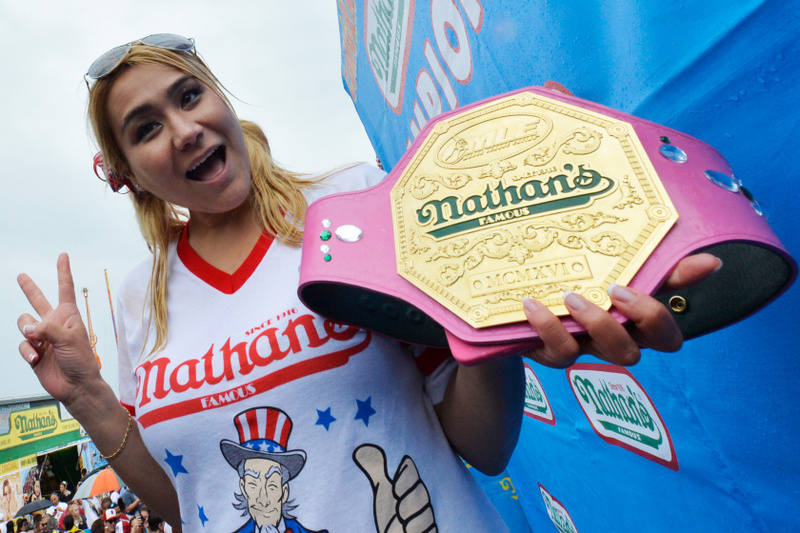 Competitive eater Miki Sudo spent her holiday morning downing hot dogs and winning the World Famous Nathan’s International Hot Dog Eating Contest. We recently caught up with Miki to learn about how she got started as a competitive eater as well as some of her favorite food scenes. FP: Tell us about your experience and emotion after winning the contest on the 4th of July. What was the most difficult part about it? MS: The Nathan’s Famous Hot Dog Eating Contest is the “super bowl” of the competitive eating circuit. Some competitors are just happy to participate, but for a few of us, it’s very serious business. To answer your question, the most difficult part was coping with the pressure (to win) that I put on myself. Losing is not an option. Emotion after winning: Just relief. I’m not particularly happy for myself or shocked because I prepare myself to win. I guess I’m just glad that I didn’t let the fans down. FP: You were impressive for sure! How did you get your start as a competitive eater? What’s the most unusual item you’ve eaten during a contest? MS: I started on a dare. There’s a restaurant in Las Vegas Chinatown that was offering $1500 to eat a 12 pound bowl of pho within an hour. I was the first person to finish it, and it my competitive eating career spiraled from there. Most unusual item: Oysters. I have a phobia, but I also refuse to disappoint. I tied for second place at the Hillsborough Ouster Festival last year. FP: Half of FP says he’d love to do an oyster eating contest! How do you train for competitive eating contests? MS: I can naturally eat up to 20 pounds. Capacity is never an issue. I only practice for speed. FP: When you’re not training, what are some of your favorite meals to eat? I love rare steak and sashimi, but I usually just eat kale and grilled chicken. FP: Where are some of your favorite places to eat around the country or in other cities you’ve visited? MS: I love Tokyo, Osaka, Kumamoto, and Fukuoka in Japan. I love Chiangmai and Phuket in Thailand. I love Seoul in South Korea. I love Belfast and Hillsborough in Ireland. In America, I love New York, The Bay (NorCal), and The 808 (Hawaii). FP: We loved the food in Hawaii and hope to return. Besides hot dogs, what are some of your guilty pleasures? We call them foodie pleasures, hence the name ;). MS: O-toro (super fatty tuna) sashimi, which can get pretty exorbitant at market price. FP: What are some of your non-competitive eating hobbies or interests? MS: I love hiking, kayaking, surfing, jet skiing, and skydiving. I’ve also ridden elephants, petted tiger cubs, and swum with sharks. Most of all, I love traveling and spending time with my family. FP: That’s an adventurous list! If you could get on a plane tomorrow and visit any place just for its food, where would it be? MS: I have not yet been to Machu Picchu or sailed down the Amazon, so I’d love to tour that area of South America. FP: Great places to think about visiting indeed! Thanks for your time, Miki. We can’t wait to hear about your upcoming eating adventures.